To promote its design services, design and innovation agency APT811 designed a direct mailer pack to reach out to potential customers to showcase what it could do. Called, “Let us grow your business with design”, the mailer aimed to create targeted awareness to introduce the agency. It was also meant to be an easy to understand kit that enabled its target audience to make prompt and accurate decisions on where to begin their brand campaign. It was targeted at those who value design and are willing to adopt design methodologies to strategically engage internal and external stakeholders through business design and brand innovation. It aimed to display its approach to business design, and how design can be an integral part of businesses – from advocating brand innovation to stakeholders’ engagement to defining and aligning brand purpose. To do so, a customised letter was addressed to the recipient to accompany each mailer. The direct mailer pack consisted of two parts – a folded A5 size pamphlet which opened up to a chart segmenting the different stages where businesses would be, with services recommended strategically for companies based on the stage they are at, thus giving them an overall idea on approaches to adopt. This aimed to help recipients start their decision-making of their brand development campaign. 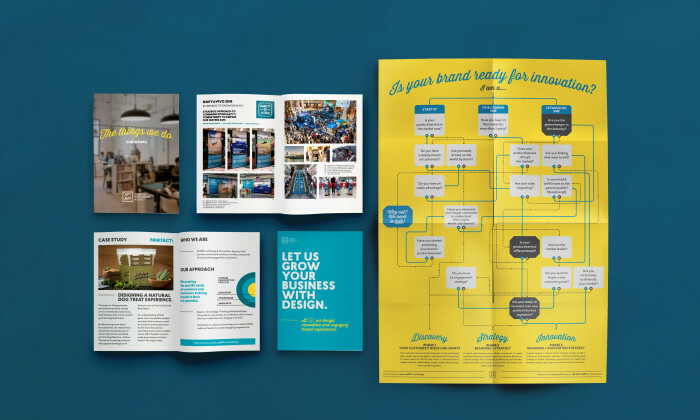 It also included a little A5 booklet showcasing some of the projects completed and the brand’s strategic approaches to engagements, innovation and brand alignment. Through the mailer, APT811 hoped to show its unique approach to business design and brand methodology. It also aimed to communicate its competency in effective strategy to design meaningful and uniquely branded experiences for businesses. An introduction and awareness direct mailer to communicate APT811’s approach to business design and innovation, defining services offered as well as proposed services for different stages of a business. Entrepreneurs and senior executives tasked to lead change in their company. The mailer gathered good feedback and awareness from potential clients. It provided them with clear information on brand requirements and approaches.